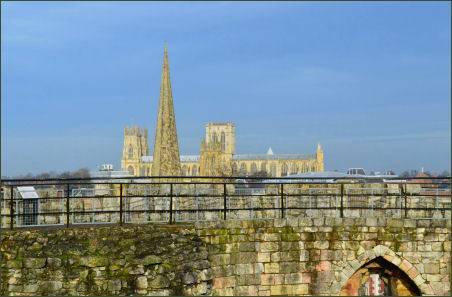 Clifford's Tower, one of the best known landmarks in York, offers excellent views over the city. 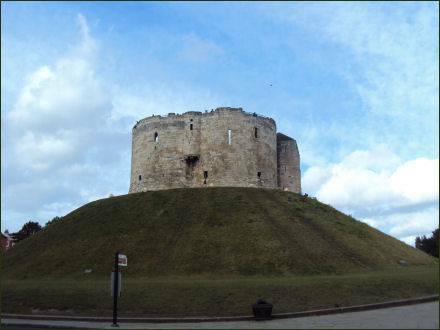 The tower is all that now remains of York Castle, once the centre of government for the north of England. When he marched north in 1068 to suppress an uprising against him William the Conqueror built a wooden castle on the conical mound. 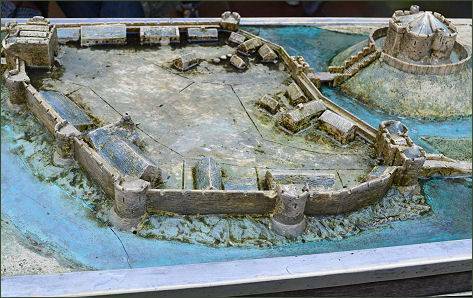 The first castle was burned by a Viking army and rebellious natives in 1069, and a second one was built to replace it, this was reinforced with extensive water defences, including a moat and an artificial lake. 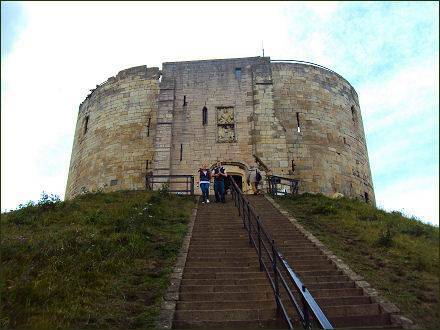 That building saw one of the most horrendous episodes in York's history, when in 1190, a mob of citizens rioted against the Jewish population of York, who took their own lives or were massacred within the tower. 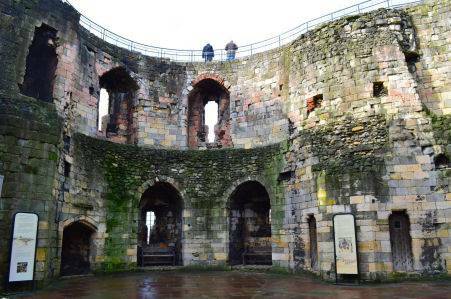 The first Plantagenet king, Henry II visited York Castle four times during his reign. 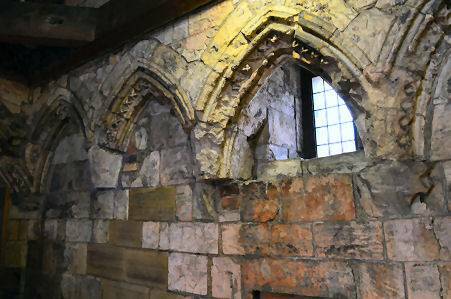 The royal chambers at the time were situated inside the keep for security. The present stone tower, which was built on the orders of King Henry III, an avid royal builder, dates to the mid thirteenth century, was probably used as a treasury and later as a prison. 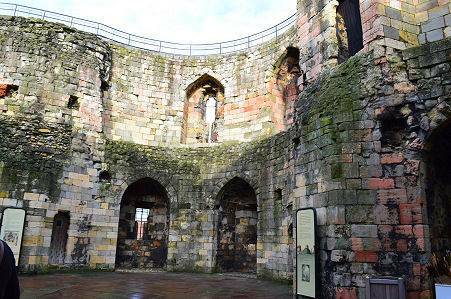 During the Scottish wars of Edward I between 1298 and 1338, York Castle was frequently used as the centre of royal administration across England, as well as an important military base of operations. The tower rises to 50 feet (15m) high and measures 200 feet (61m) in diameter. Its design is 'quatrefoil', with four overlapping circles, resembling a four leafed clover. The tower acquired its present name when, in 1322, Roger de Clifford was executed by King Edward II for treason. Clifford was hanged in chains from the walls of the tower, and since then the building has been known as Clifford's Tower. 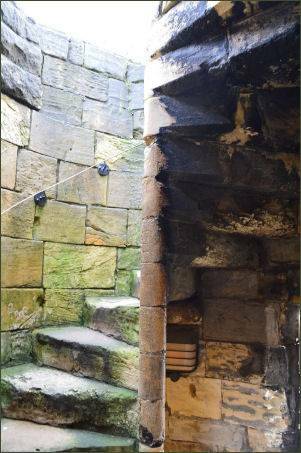 The medieval Chapel in Clifford's Tower is situated above the main gate. 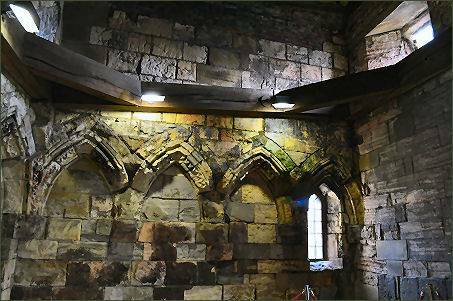 With its decorated arcading along the walls, it contains some of the best surviving architecture in the structure. The tower was occupied by Royalist troops in 1642 and later in the same year by Parliamentarians. Much of the tower that visitors see today dates from the thirteenth century, with some seventeenth century additions, including the Debtor's Prison, Female prison, and Assize Court. 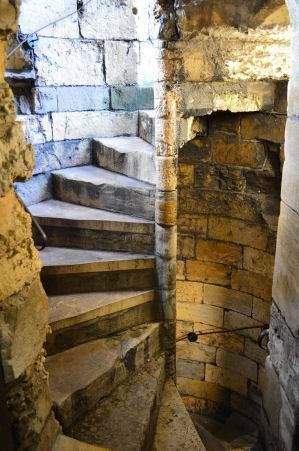 Spiral staircases lead to the walls, which provide excellent views of the city. 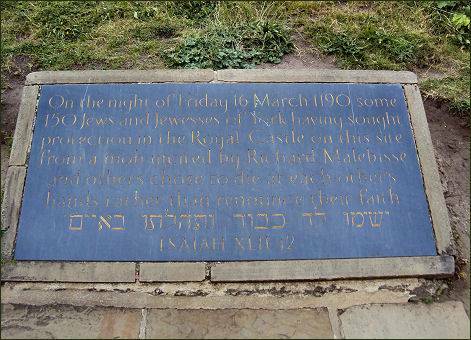 York Castle witnessed one of the most notorious events in English history, the mass suicide and massacre in March 1190 of York's Jewish population. Tensions between Christians and Jews had been increased during the twelfth century in England, the fact that many were in debt to Jewish moneylenders was partly responsible for the antagonism but also much crusading propaganda was directed not only against Muslims but also against Jews. Anti-Jewish riots in several cities followed the coronation of the crusader king Richard the Lionheart in 1189, and an untrue rumour circulated that the new king had ordered a massacre of the Jews. Tensions broke out into violence the following year in York. Richard de Malbis, who owed money to the influential Jewish merchant Aaron of Lincoln, exploited an accidental house fire to incite a local mob to attack the home and family of a recently deceased Jewish employee of Aaron in York. Josce of York, the leader of the Jewish community, led the local Jewish families into the royal castle, where they took refuge in the wooden keep. Trust between the royal officials and the Jews broke down. The officials, finding themselves shut out from the tower, summoned reinforcements to retake it. These troops were joined by a large and angry mob, who surrounded the castle, and when the constable left the castle to discuss the situation, the Jews, fearing the entry of the mob or being handed over to the sheriff, refused to allow him re-entry.The constable then appealed to the sheriff, whose men laid siege to the keep. The siege continued until 16 March when the Jews' position became untenable.